Hope you all have had a blast celebrating the birth of our country! 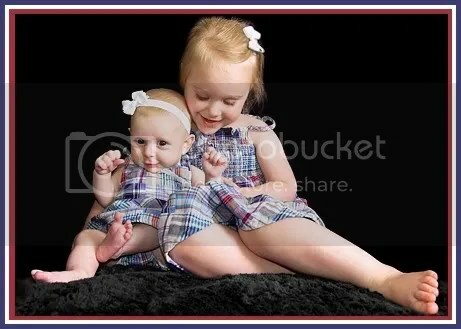 The girls had a wonderful time posing (and playing) together in the adorably matching red,white, and blue dresses that Gammy brought for them! No barbecue or fireworks for this tiny lady, but even so, this is an extra-special day for little Ro – it’s her very first official holiday! Doesn’t she look happy about it? T didn’t really feel like having her picture taken this morning, but she allowed me to snap a quick shot or two before prancing off in search of one of her patriotic popsicles. It’s okay, she can have the day off! SuperPuff has sat for more than her share of holiday pictures, and the fourth of July was her very first holiday, too. . . you know what that means, right? Time for a trip down memory lane (yeah, I know, we just did this on her birthday. But I seriously love doing these so, um, sorry? )! T’s first fourth… I’ve never really liked this picture, and will always be disappointed that I had no red,white, or blue to dress her in for her first holiday ever (I still didn’t have clearance to drive after my c-section), but I am glad that I have this capture of T’s first ever holiday – even if the picnic theme didn’t really work out . . . poor little thing looks like a baby bird squawking for a worm! I LOVE the basket photo! It’s adorable and the lighting is perfect! 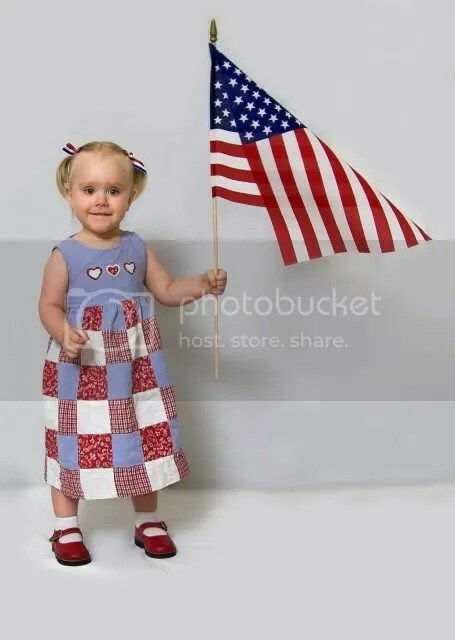 Little Ro is a doll and is enthusiastic about our country’s special day! As usual your pictures take the cake! Have a great week with your sweeties! 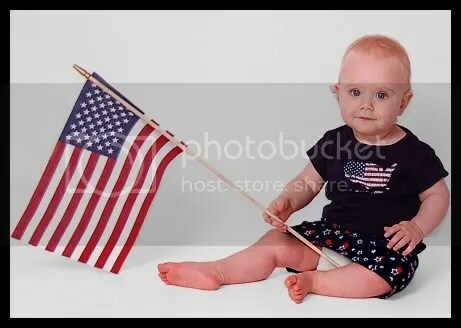 Really cOOl that you now have 4 different T 4th of July pics to compare. Oh my, your girls are precious in their red, white, and blue!! Beautiful! How are they getting along? and I love the basket pic! 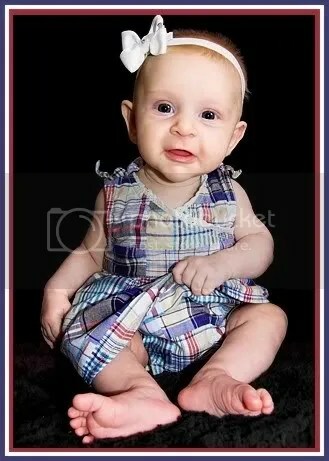 Ro really looks like Miss T as a baby! It is so fun to see how they change! I am amazed at how dedicated you are at coordinating an outfit AND getting pics each year! They get along great, although T sometimes is a bit too enthusiastic in her affections and has to be warned to be gentle. Your holiday pix are the best. Is Ro sitting up by herself??? What a strong girl! Thanks! And goodness, no! The beauty of the black background is that she’s being propped up invisibly. . . but she was holding her head/shoulders up alone – she’s got great head/upper body control. We had a good Canada Day weekend thing going on. Busy. Great weather. Healing. 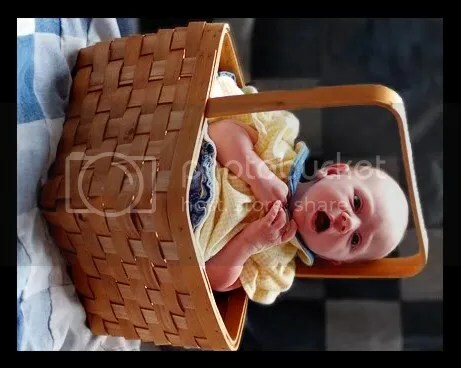 The basket photos is priceless, my girls used to put the youngest in one all the time. The girls look so happy. I’d say you are loving them well .Inside and outside beauty . I’m adjusting to having my five around , the schedules are wonky, the computers are wonky, my body is wonky, …. sigh. You’ve never been to a parade? Okay, that’s it, you ‘ve got to bring the girls to New Braunfels next year and be IN the parade. I’m betting T & Ro are naturals. Then you can play at Landa Park, take the girls to Natural Bridge Caverns, eat real Texas BBQ and get cowboy hats for the whole crowd. I can’t wait to see the pictures from that trip! i desperately wanted to take pics of this cute girl in a checkered jumper at our 4th of july party. however, i didn’t know her or her parents and thought it might be kinda creepy if i stalked their daughter all night. Aww, love the photos as always. 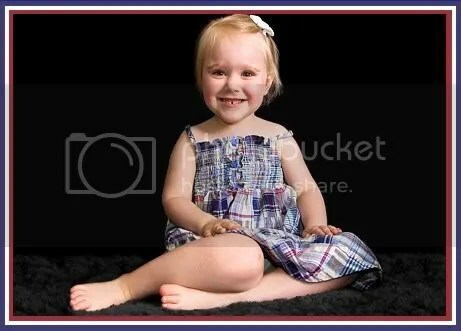 Precious pics! Just look at that first one! Ro and T are so unique, the solo shots are wonderful. I really admire your ability to document their babyhoods with such gorgeous photos.